Skoda has announced details of a limited edition version of its hugely popular Fabia Monte Carlo model, called the Monte Carlo Tech, with an enhanced specification over the standard model. The Limited Edition Skoda Fabia Monte Carlo Tech! The Skoda Fabia Monte Carlo will be limited to 1,000 cars and buyers will benefit from a state-of-the-art Amundsen satellite navigation system and Bluetooth connectivity at no extra cost. These are in addition to the Skoda Fabia Monte Carlo’s striking sports-styled exterior, which includes piano-black body trim, black door mirror covers and radiator grille top, smoked headlamps and black 17-inch lightweight alloy wheels. Inside, the Skoda Fabia Monte Carlo there are all black sports seats which boast additional side support. Both Monte Carlo Tech versions come with black roof lining, a perforated leather steering wheel with red stitching, and a leather handbrake and gearstick gaiter. To complete the look, silver kick plates and steel pedals are fitted as standard. The Skoda Fabia Monte Carlo is available in two striking colour combinations – red with a black roof or white with a black roof. There are two engine choices: a 1.2-litre TSI 105PS petrol and a 1.6-litre TDI 105PS diesel. 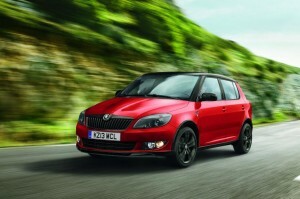 Sales of each engine will be restricted to just 500 units of the Skoda Fabia Monte Carlo. The cars are priced £11,990 OTR and £12,960 OTR respectively. The Skoda Fabia Monte Carlo was launched in January 2011 to celebrate 100 years of the Monte Carlo Rally, and to commemorate the 110th anniversary of the company’s motorsport commitment. Since then the Skoda Fabia Monte Carlo has been a huge success for the brand in the UK and more than 4,000 have been sold since launch. The Skoda Fabia Monte Carlo is a decent well made car – Skoda has been in the top 10 of the JD Power Survey of Customer Satisfaction for the past 20 years. There’s also a very good finance deal on offer from Skoda though, as I keep saying, the Skoda Fabia Monte Carlo is one car that will undoubtedly be cheaper to lease than to buy. This entry was posted in Car Updates & Releases, New Cars, Popular Cars, Small Car and tagged alloy wheels, caption, car, Fabia Tech, Hatchback, lease the Skoda Fabia Monte Carlo, Limited Edition Fabia, Monte Carlo Rally, Monte Carlo Tech, New Skoda Fabia Monte Carlo Tech, skoda, Skoda Car Leasing, skoda fabia, Skoda Fabia Lease, Skoda Fabia Limited Edition, Skoda Fabia Monte Carlo, Skoda Fabia Monte Carlo Tech, Skoda Fabia Monte Carlo Tech 2013, Skoda Fabia Monte Carlo Tech Engine, Skoda Fabia Monte Carlo Tech Price, Skoda Fabia Monte Carlo Tech Spec, Small Car, sports car, steering wheel, TDI, TSI, UK by Steve Lumley. Bookmark the permalink.